For people in King Island, Furneaux Islands, Western, South East, North West Coast, Central Plateau and parts of Upper Derwent Valley, Central North and Midlands Forecast Districts. Issued at 9:41 am Saturday, 7 July 2018. Damaging southwesterly winds with peak gusts around 100km/h are possible over western, central and southern areas, and the Bass Strait Islands late tonight and during Sunday. Weather Situation: A cold front over eastern Tasmania will move away this morning, causing a southwesterly stream to extend throughout. The stream will strengthen tonight as another cold front crosses, and vigorous southwesterly winds will persist throughout most of Sunday until a slight easing in the evening. 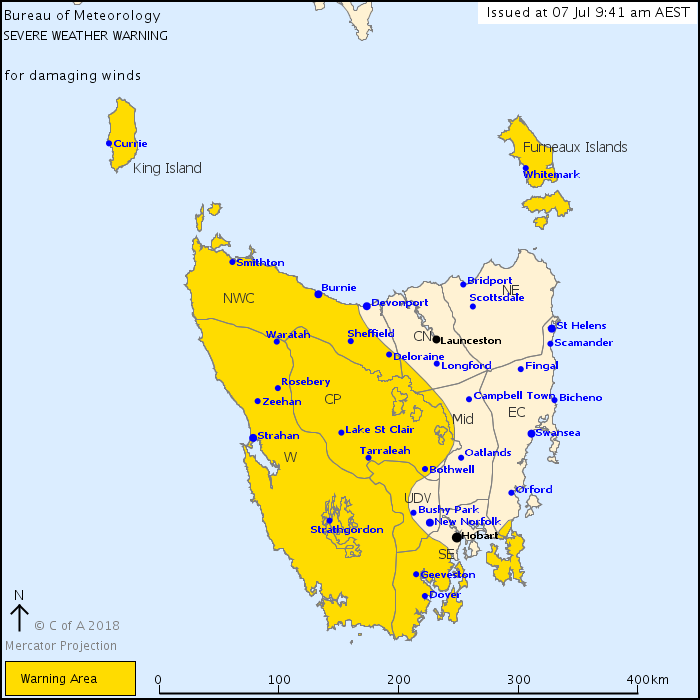 DAMAGING SOUTHWESTERLY WINDS, averaging 60 to 70 km/h with peak gusts in excess of 100 km/h are possible over western, central and southern areas, and the Bass Strait Islands late tonight and during Sunday. Winds are expected to moderate slightly on Sunday evening. Locations which may be affected include Burnie, Currie, Smithton, Whitemark, Strahan, Queenstown, Zeehan, Bothwell, Tarraleah, Geeveston, Dover and Huonville.